Description: Dog walker on the river park path gets a gander at one of EMDs latest and finest, SD70ACe 4847 leading a former Conrail unit and unit trash train K277 west on 1 under Chestnut Street in center city Philly. Description: Q436 just east of QB 119 in Huntington. Description: Q436 eases downgrade over Depot Brook in Washington. Description: Q437 on the move west of CP-79 at 12:55 with CSX 4773 and 4847. Description: Of course this couldn't have come through here earlier when the light would have been far more favorable, but when you get one of these rare ACe leaders, you take what they give ya. EB at Locust on the Philly Sub. Description: EB at Locust on the Philly Sub. Description: With lease & foreign units in short supply & GEVO's ruling the roost on this end of CSXT these days, you have to hope for some of their own rare birds to take flight to keep things diverse in the viewfinder. Witness one of only 20 "Aces" on the CSXT roster pulling empty racks from Taft Ramp up to "Rachel's" for their brake test. Not everyone shares this enthusiasm for the Ace, just look at the writing in the grime on the nose. Description: Using trackage rights over NS to the coal-fired Plant Mitchell in Albany, GA, an mty CSX coal train heads northward on NS for interchange back on home rails at Oglethorpe, GA. Description: CSX Q702 is headed east with empty waste containers on this Saturday morning. 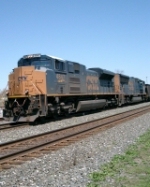 Description: someone likes the EMD SD70ACe's! Description: CSX B75628 heads north.